One of the best things about summer is eating watermelon, especially when you find the perfect one(sweet and juicy!). Not only is watermelon a great way to celebrate summer, it's also a great way to add more fruit into your diet. The sweet flavor makes watermelon one of the easiest fruits to enjoy, and when you nosh on this summer food, you'll get a host of other benefits too. Most people spit out the seeds when enjoying a slice of this red fruit, but you may want to rethink that. The seeds are actually high in protein (a single cup contains 60 percent of your daily recommended value! ), according to Live Strong. If you need another reason to nosh the seeds, consider that they contain more than one B Vitamin, which helps you get more energy, the natural way. To top it off, watermelon seeds also contain high levels of magnesium (which helps lower blood pressure), zinc, iron and healthy fats! Feel free to nosh away on these seeds at will. High levels of lycopene in watermelon seeds can help reduce the appearance of aging, give your skin a boost and help with libido (triple win! ), according to Style Craze. The unsaturated fats and antioxidants in the seeds can help firm up the skin and improve moisture. Try applying watermelon seed oil to your hair to help add extra moisture without making your hair greasy. The natural vitamins and minerals in the watermelon oil can keep your hair strong, according to Style Craze. Health Line reports that noshing on a bit of watermelon rind could help men *cough, cough* last a little longer in the bedroom. Citrulline, an amino acid in watermelon, can help improve mild erectile dysfunction symptoms naturally. Watermelon is good for men's health (in more way than one!). 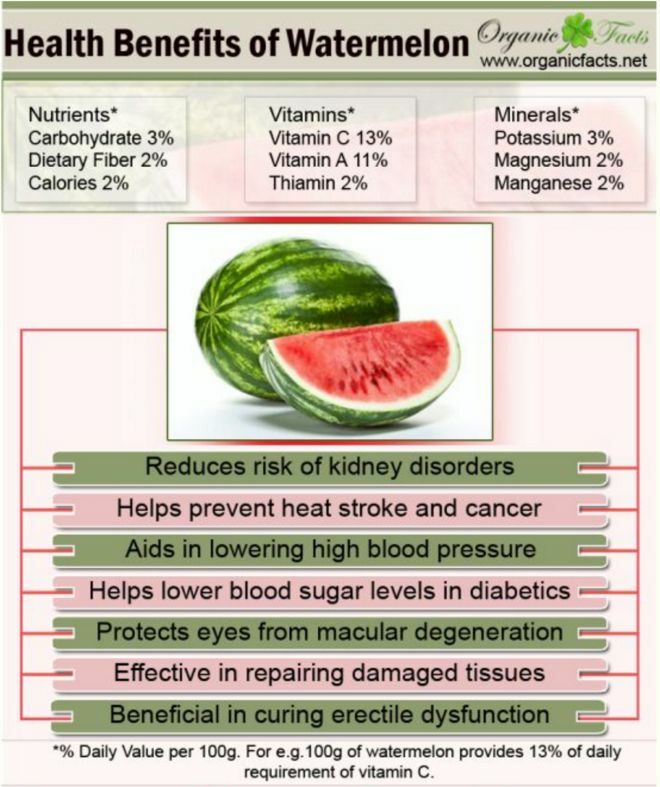 Watermelon contains marked levels of lycopene, an antioxidant researchers believe help thwart prostate cancer. Health Line reports that more studies are needed, but early news looks good. 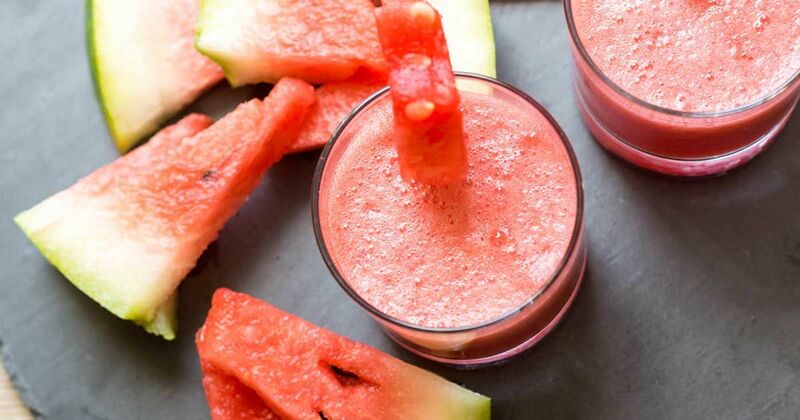 Chug some watermelon juice before you exercise to avoid post-workout soreness. The juice contains L-Citrulline (the same thing that helps with erectile dysfunction), which can help prevent muscle pain. Watermelon juice is high in sugar, so use it sparingly, according to Mercola. Watermelon is high in water and fiber content, so you're digestive track will have plenty of motivation to stay regular, according to Medical News Today. If you find chugging 8 glasses of water per day a little intimidating, try eating watermelon. Watermelon is 92 percent water, so it can keep you from getting dehydrated, Medical News Today says. Similar properties that help prevent muscle soreness can also ease inflammation in the joints. Choline helps you sleep better, improves memory and helps absorb fat (which reduces chronic inflammation). Blend 3 cups of watermelon, 1/4 cup parsley, 2 cups kale, 2 teaspoons green tea powder, 3 tablespoons pineapple juice, juice from 6 limes, and 1/2 peeled/pitted avocado in a blender for two minutes. Enjoy! What's your favorite way to eat watermelon? Share your thoughts in the comment section below.